Will 2016 be Another Year to Forget for Pig Producers? 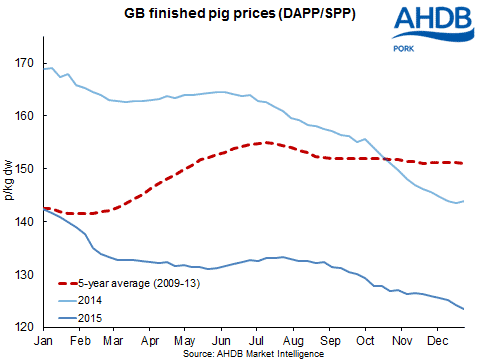 UK - In terms of price, 2015 was a year to forget for pig producers. A combination of factors throughout the year contributed to the steadily declining price. These include increased production, the pound-euro exchange rate, the gap between UK and EU prices and subdued consumer demand. So what do the trends in 2015 tell us about 2016? Well, for 2016 supplies available for consumption are forecast to increase again, which will keep pressure on the UK pig price unless demand increases accordingly. So far, however, consumer demand has not increased in response to low prices. With global and EU markets also expected to remain under pressure and uncertainty about the exchange rate, it seems that, unfortunately, 2016 may well be another year producers will want to forget. To read further analysis of the factors affecting the pig market in 2015 and what they tell us about 2016, click here.